I found another great place where to stay in Umbria. This time it wasn't by chance, I really wanted to rent apartments in Umbria in a beautiful farm house or agritourism, as it is very much en vogue to call this type of accommodations these days. Of course I looked for my property in Umbria near the Lake Trasimeno, as this is a great area where to sojourn since you will be feeling like you're near the seaside with many water sports to carry out during your holiday. In addition all the towns around the lake are very much lively and filled with nice restaurants, especially fish restaurants. I know what you're thinking: lake fish is not that good to eat, but you're actually wrong as with the summer season the fish comes towards the surface of the lake eating the yearly insect offspring, thus becoming tasty and losing its murky flavor. So, getting back to these apartments in Umbria, the name of the farmhouse is Il Piratello, and it is located in Tuoro sul Trasimeno. 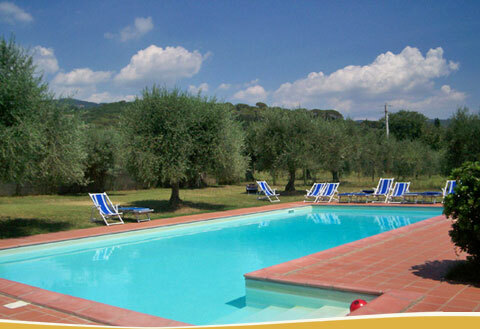 It includes six apartments with no breakfast, for self catering holidays in Umbria. The outdoors of the farm house are the typical Umbrian stone walls intertwined with red bricks with nice roses and jasmine bushes crawling up and decorating portions of these sun baked stone surfaces. The indoors of each apartment in Umbria at Il Piratello is a very nice rustic accommodation equipped with all the necessary modern comforts for your holiday. I'm sure I will have a great time cooking the typical Umbrian dishes while staying here. The kitchen has enough space to cook every meal and includes an electric oven and gas range, so I'll make sure to prepare a different dish every day. Even the bedrooms look very comfortable. I will let you know how comfortable beds are after I slept in mine the first night! The agritourism is surrounded by a green lawn, many olive trees and orchards. The house itself is very pleasant to look at, with nice finishings and details that bind this place to its rural origins. The landscape all around is fantastic, sweeping over the territory across Umbria and Tuscany. I am spending €400 for a week at this apartment in Umbria, and I think the money is well worth my sojourn, but of course I will let you know after my return from Umbria.